When planning to eat healthy food, sooji idli is a great and tasty and healthy food to start your day with… Trust me 3-4 of the idlis with a glass of cold coffee or Mango shake (why to miss out on it since it is Mango season ) kick starts your day.. Mix the roasted sooji with salt and curd, add some water to make a thick batter. Keep aside for 15 mins. In a pan heat the oil and add mustard seeds and curry leaves, allow them to crackle. Now add the vegetables and saute them for a few mins. Add these vegetables to the sooji batter and mix well. Grease the idli stand with some oil. 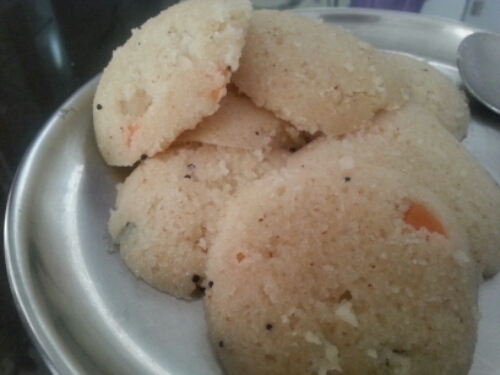 Add the eno powder to the batter mix properly and fill the idli stand. Steam the idlis, generally takes 7-8 mins to steam. Can check by inserting a toothpick and make sure nothing sticks to it. I have used various variations for vegetables, like spinach, peas, capsicum… basically anything available can be used.. Or you can eat them plain also. Serve with any chutney or Sambar.